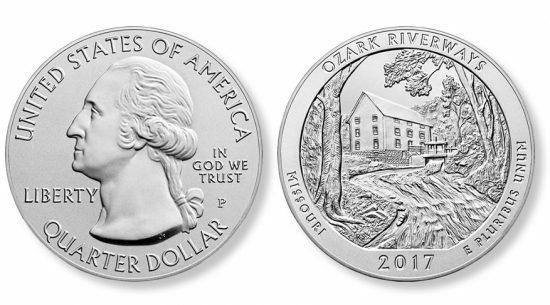 Ozark National Scenic Riverways is honored on a 5-ounce silver coin that the United States Mint is introducing on Tuesday, July 11. This numismatic or collector coin is the third this year and the thirty-eighth overall from the U.S. Mint’s program of America the Beautiful 5 Ounce Silver Uncirculated Coins. Program issues are produced at the Philadelphia Mint, each bearing a ‘P’ mintmark, to a diameter of 3 inches in 5 troy ounces of 99.9% pure silver. Ozark National Scenic Riverways was established in 1964 to protect the Current and Jacks Fork Rivers in the Ozark Highlands of southern Missouri. It is the first national park area in the United States to protect a river system. Reverses (tails side) of the silver coin show Alley Mill, a steel roller mill built in 1894 to convert wheat into flour. It is one of over 100 historic structures found within the national park. Much of the mill’s original equipment is still in place and available to see by tour. Ron Sanders created the artwork while Renata Gordon sculpted it. This design made its first appearance on the Ozark Riverways quarter, which went into circulation on June 4, 2017. (The U.S. Mint is also selling rolls and bags of the quarter in circulating quality.) 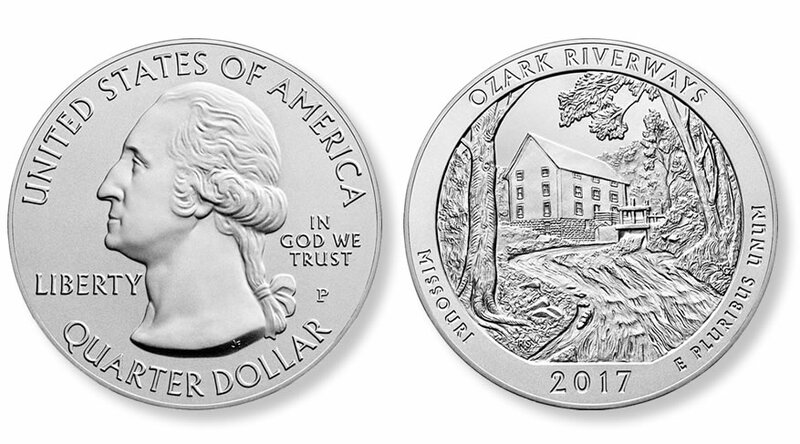 The quarter and 5-ounce coin have common reverse inscriptions of OZARK RIVERWARYS, MISSOURI, 2017, and E PLURIBUS UNUM. Obverses (heads side) of America the Beautiful coins share John Flanagan’s portrait of George Washington and surrounding inscriptions of UNITED STATES OF AMERICA, LIBERTY, IN GOD WE TRUST and QUARTER DOLLAR. Quarters have reeded edges while edges of 5-ounce silver coins are smooth and have lettering of ".999 FINE SILVER 5.0 OUNCE" to denote their composition and weight. Priced at $149.95, the 2017-P Ozark National Scenic Riverways Five Ounce Silver Uncirculated Coin is available July 11 at noon ET from this U.S. Mint product page. The maximum mintage for the silver coin is established at 25,000. A similar 5-ounce bullion silver coin has been available since June 4, 2017. It shares the same designs and major specifications as the uncirculated collector coin but lacks a mintmark and has a brilliant finish. U.S. Mint sales of the bullion piece now total 20,000. Intended for investors, the U.S. Mint does not sell bullion coins directly to the public. Instead, they are released through a network of authorized purchasers for a small premium above their melt values. The coins are currently available for about $40-50 over their silver value, with discounts available when buying higher quantities. The next two silver coins in the 5-ounce collector series will debut in intervals throughout the year.